Since the Brexit also puts the euro at risk, I’ve got my one eye on this long-term reversal pattern on EUR/CAD then I’m zooming in to the 1-hour time frame for a potential entry. As you can see from the pair’s daily time frame below, a head and shoulders pattern appears to be forming, which means that price has a lot of room to move south. Price hasn’t broken below the neckline, though, so it’s too early to say that it’s in for a drop of more than two thousand pips or the same height as the chart formation. Still, I’m bearish on this pair mostly because of the post-Brexit uncertainty in the euro zone and also the oil strike in Nigeria that might dampen supply and push prices up. Price action is still a bit of a mess after that EU referendum volatility but it looks like the descending channel stayed intact. 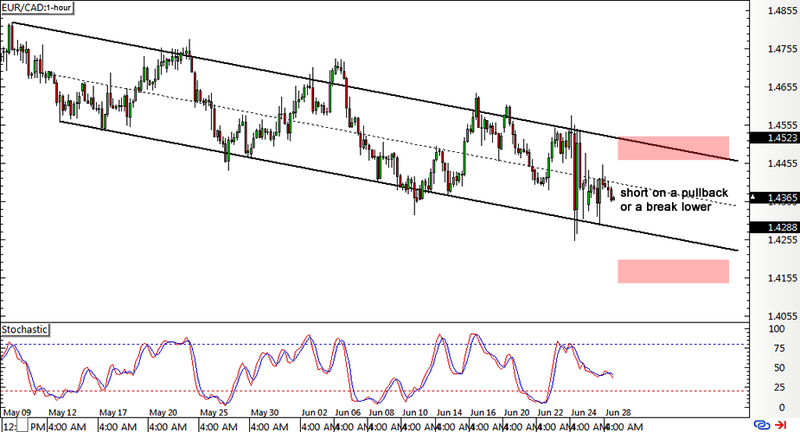 I’m looking to short on a pullback to the top of the channel around the 1.4450 minor psychological mark or on a break below the channel support below 1.4250. Depending on where I’m able to short, I’m looking to place a wide 400-pip stop, which is around the pair’s weekly ATR. 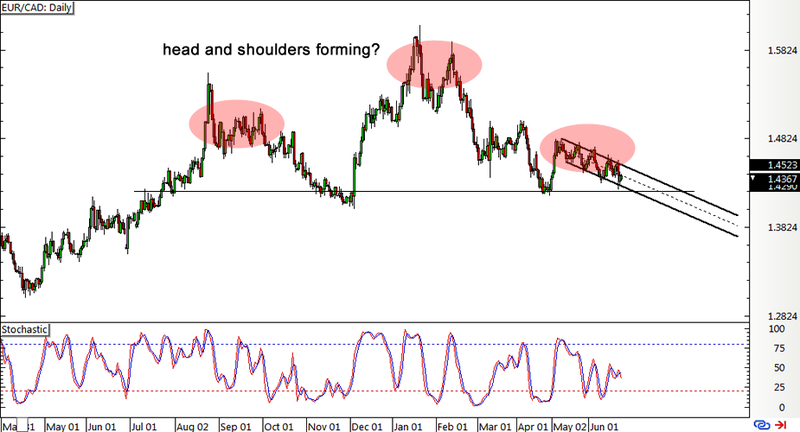 If EUR/CAD breaks below the neckline around 1.4000-1.4100, I’ll add to my short position. I’ll keep you posted on my trade actions thru my Twitter account so make sure you’re following me. As always, don’t risk more than 1% of your account on a single trade and make sure you read our risk disclosure if you’re thinking of taking the same setups!